European equities have rallied with the DJ Stoxx up 8.5% year to date. During this period, the performance of the euro has been even more impressive, up 11%. Would further gains in the euro start to hurt earnings of European companies? Citi analysts find little evidence that a strong Euro hurts European companies' earnings. Data over the last 15 years shows that economic growth in the euro area is more important in driving earnings of European companies. However, Citi analysts find that Euro strength affects the relative performance between sectors. Sectors that derive a large share of their revenues overseas, such as Healthcare and Technology tend to underperform when the euro strengthens. Domestic sectors, including Utilities and Banks tend to be more resilient to euro strength. 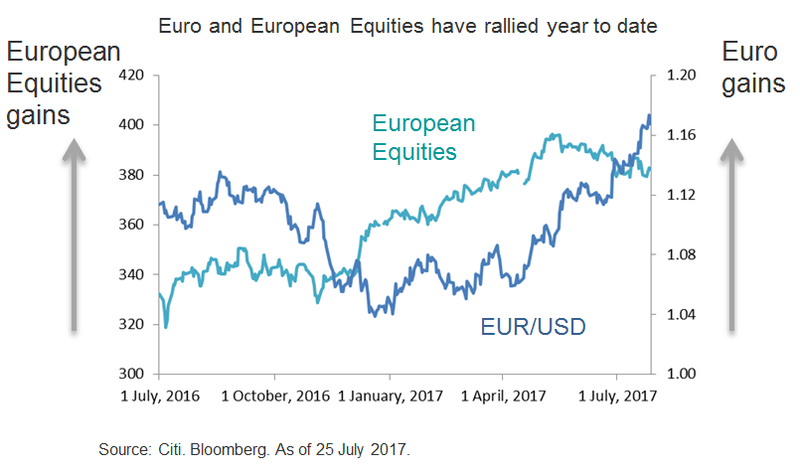 Citi analysts have a positive outlook on European equities given fading political risks and a broadening economic recovery. The strength in the euro this year has been largely driven by persistent strength in the economic data from Europe (ex UK) and the reduction in political risks post the French presidential election. In this context, euro strength is to be welcomed by investors and not feared.